Identical to Black Max Black-Series except for grey color polymer housing and Tactical Solutions wrap around extended magazine release. Enamel painted polymer housing with satin sealer coat. The grey polymer housing was discontinued by Ruger in 2008. Requires careful handling to avoid deep scratches to the finish. Do not use solvents. Hunting, target shooting, fast-action shooting sports. Drop-in ready, custom-made trigger assembly for the Ruger 10/22 LR rimfire rifle. Instructions included. No gunsmith required. New Performance Upgrade Option Included: Tactical Solutions Extended Magazine Release. Satin Black. Installed. Red trigger option RTO included. New Performance Upgrade - 11/4/2012: Very crisp 2-1/4 lb. or less trigger release. Zero takeup. Zero creep. Zero trigger play. The ultimate varmint & squirrel hunting trigger where pinpoint accuracy and fast on-the-mark followup accuracy is required. *Certified* Trigger Weight: Each trigger assembly is vertically clamped to a vise. An exact 2.25# fixed weight is hooked to the center of the trigger for measurement testing. Exclusive Hornet Custom ZTUO feature: Zero take-up. Zero creep. Zero trigger-play. Generation II Ruger hammer, sear, & disconnector custom matched, tuned, and meticulously hand-fitted. 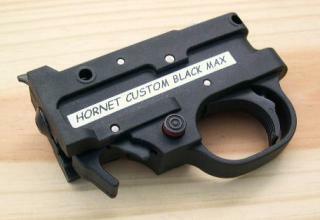 Factory polymer housing and modified trigger contour. Stainless steel drift pins and custom trigger pivot pin pack for smoothest trigger release without trigger play. We smooth-out the coarse factory safety motion. Stealth Setup: All black. Your competition will have no clue what you are shooting. Weight advantage: 4.9 oz. vs 7.0 all-metal. Satisfaction Guaranteed: 30-day money back, excluding postage. 12-month unconditional warranty. Since 2001: More than 6,000 satisfied customer trigger sales. The Best Performing All-Around Ruger 10/22 Drop-in Ready Trigger Assembly in the Market. Guaranteed. Test-fire live rounds with any other complete trigger group in a comparative "blind-fold" test. We are confident which one you will select. Take-up or trigger slack is commonly referred to as a "mushy" trigger pull. Creep is the coarse, gritty trigger release associated with CNC machine cut parts. For a sear-hammer-disconnector trigger engagement, these parts are further not polished nor hand-fitted for cost-cutting purposes. Legal Notice: Ruger® 10/22® is a registered trademark of Sturm, Ruger & Company. Refer to and abide with the safety requirements in the factory Owner's Manual.